After coming home from the gym in the pouring rain, I needed something warm and an equivalent to what Nigella Lawson would call “temple food”. I looked into the fridge and pulled out a block of tofu, some green onions and a couple sachets of miso. Easy! I would quickly whip up some miso soup and then settle down to watch my guilty pleasure, America’s Next Top Model. In my mind, going to the gym and eating miso soup would negate any negative effects from enduring a trashy tv show. Actually, who am I kidding? I’d watch ANTM any old time! Pass the Cheetos! *I had some fresh chinese noodles on hand in the fridge so I added that before I added the tofu. I also added a large handful of frozen corn to the simmering broth. If I had some peas, I would have added that too. Heat oil in a large pot and lightly saute the green onions. Add water and miso paste, stirring until the miso has dissolved. Bring to a boil. Add tofu* and serve with a splash of soy sauce or hot sauce, if desired. What does it taste like? I’ve seen different kinds (referred as different colors) but not sure what that ment! Nope, miso soup is really simple to make, Tanvi. Miso is fermented rice paste and the lightest in colour is the lightest in flavour and the darker the miso, the more pungent. I used yellow miso. I’ve bought it before in tubs sold at a health food store, but this time I used individual packets that I bought at a Asian superstore. Joe, see above! Miso is nice and salty and mild tasting. In the past, I’ve made a delicious miso-ginger salad dressing, so it’s quite versatile and not just used for making soups! You can even use it to coat salmon before barbequing or roasting. Give it a try. I always assumed miso soup was complicated to make, but your recipe is so simple- definetely making this once I track some miso down. Any suggestions as to which sort of miso to use? The winter cloud cover has settled over us in Kelowna & your miso soup looks like the perfect warm-me-up. I’ve never cooked with miso before… may just give it a try now. Looks delish & healthy. I had no idea miso soup would be so easy! I’m definitely going to try this. Heather, miso soup is great for those cold, grey days! Crystal, it is one of the simpliest soups to make. You can also add some dried seaweed to the broth to make it more authentic. If I had some handy, I would have added it in. And, I’m thrilled about the swap. Yay, mail! 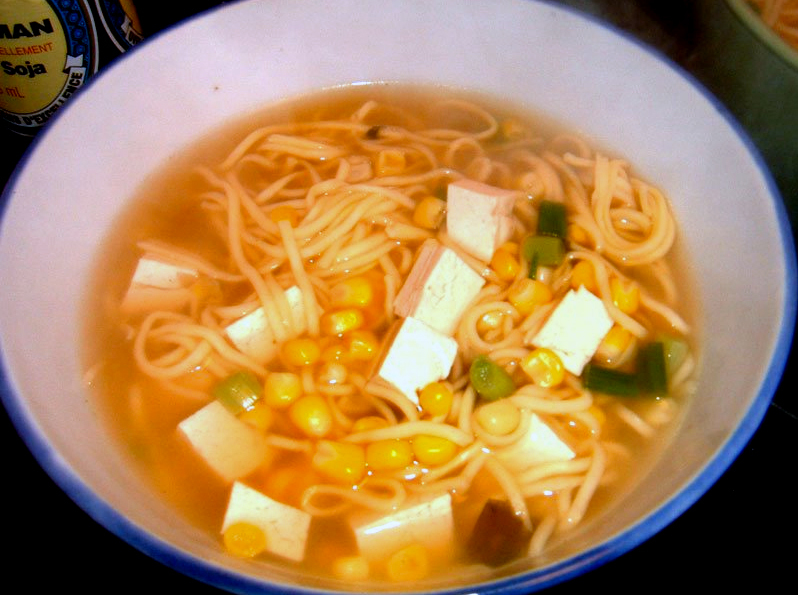 I’m making this soup this week…I searched and searched for miso, and finally found a package at a gourmet supermarket. It just says “Yamabuki Shiro Miso,” but it looks yellow, so hopefully it’s the right one! I got some fresh linguine, tofu, and peas to put in there, too. I’ll let you know how it goes! Oh, let me know how it turns out Crystal! Kickpleat said: “Miso is fermented rice paste”. Not so, Miso is fermented from soybeans, not rice. Also, you can use simmer kombu seaweed, dried bonito flakes, or dried shiitake mushrooms to make a soup stock before adding any other ingredients. Wakame seaweed is often added in Japanese restaurants. It’s a thin, soft, dark green seaweed. joe, what i have in my fridge is fermented rice miso. miso can also be made with soybeans or barley (see wikipedia definition. so we were both half right! Mmm, wakame. That’s the green leafy seaweed that you’ll find in miso at a restaurant. It’s sold dried and crunchy-looking (by the nori, if you’re at the store) but it reconstitutes itself nicely in water. And it’s very good for you. Shiro miso (white miso) is milder-tasting than aka miso (red miso), but I’m sure you can use either of them to make the above soup taste delicious! They’re more common in the winter and summer, respectively. What’ s the refrigerated self life? There isn’t an expiration date on the package.